Since the peak of the 2016 El Niño warming event, global temperatures have fallen by a little more than 0.3°C. 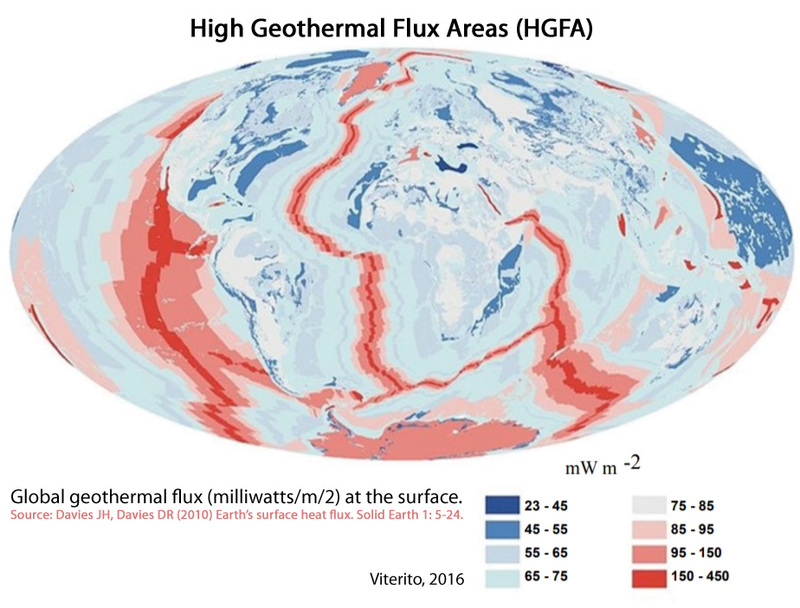 Last year, Dr. Viterito succinctly explained the processes connecting high geothermal heat flux areas to the climate system. In a new paper, Dr. Viterito has continued using seismic pattern analysis to formulate a very precise near-term temperature prediction: Global temperatures will continue their ongoing descent to about -0.47 °C below the 2016 peak by the year 2019. James Edward Kamis has been making similar claims at Climate Change Dispatch. One round of beer from you for everyone here if the author’s prediction turns out to be wrong in 2019? Don’t know how we’d consummate the bet since we live across the pond from one another. 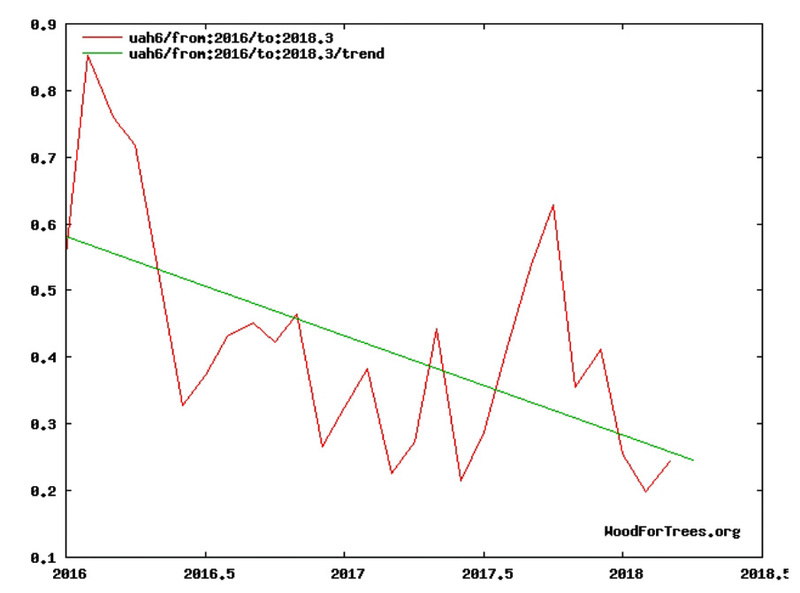 But since we’re already over -0.3 C (trend, not anomaly) since 2016, the likelihood that we’ll fall another -0.15 C by the end of next year isn’t an extreme prediction. Don’t know how we’d consummate the bet since we live across the pond from one another. We live in the age of online deliveries. Should be easy to send beer to the winner of a bet. You can even do it anonymously (at least in Germany). Let’s see what the NH summer does to the mean temperature and how this meter (http://www.bom.gov.au/climate/enso/outlook/) maybe goes to the right again this year. I find it highly interesting that you chose to post these two graphs. As AndyG55 never gets tired off telling us that it is impossible to determine OHC before the 2000s because there weren’t accurate measurements, you come up with this reconstruction of Pacific ocean heat content to claim that modern change in OHC isn’t that big. I’ll ignore this particular and poorly done comparison to CO2 concentration. The next graph is also a great attempt at misrepresenting data. I am sure you see this as evidence that CO2 has no effect, right? At least the 20th century part of the displayed temperature record matches Gistemp, so continued up until today the graph would end somewhere between +1.0 and +1.2 degrees. I can’t find a good reconstruction for CO2 concentration right now, but I am sure the “small” changes in temperature before industrialization match up pretty well with the expected CO2 concentration from oceanic outgassing caused by the temperature changes. Only the last few decades don’t match … why? Because of the human influence on CO2 concentration and the yet to come full realisation of that change. Anyway, do you now support that temperatures 1000 years ago were not similar to today’s temperatures? According to that second graph and matching up with current temperature records, the current anomaly is twice as high as in the year 800/900. I can’t find a good reconstruction for CO2 concentration right now, but I am sure the “small” changes in temperature before industrialization match up pretty well with the expected CO2 concentration from oceanic outgassing caused by the temperature changes. So CO2 rises…as oceans cool? Only the last few decades don’t match … why? Can you point out what about the little red trend at the end (1955-2010) is detectable against background noise? The last few decades of changes in OHC aren’t even detectable relative to the past long-term changes in OHC, when changes were far more pronounced and rapid. Recent ocean warming is even considered to be “below the detection limit”, whereas temperature changes in the ocean naturally change 6 times greater/faster than they have in modern times. The graph extends from 16 AD to 2010. (Did you fail to read the bottom?) Temperatures in 2010 were still lower than they were during the Medieval Warm Period per this graph, not “twice as high” as you claim. Even worse, about 80% of the rise in temperature from the 1600s to early 20th century occurs prior to CO2 emissions rising above 1 GtC/yr. Something else besides the 1-to-8 GtC/yr emissions increased caused nearly all of the modern warming. So what was it? At least the 20th century part of the displayed temperature record matches Gistemp, so continued up until today the graph would end somewhere between +1.0 and +1.2 degrees. What are you even talking about here? CO2 rises as ocean temperature increases. Also, you do know that other reconstructions of the OHC exist, do you? 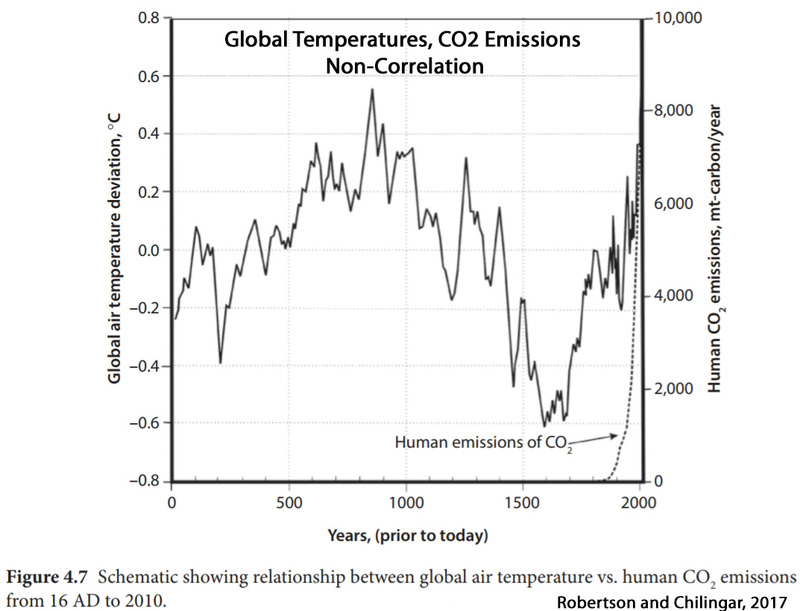 Can you identify modern warming in the graph provided in the paper I linked to? The graph extends from 16 AD to 2010. (Did you fail to read the bottom?) Temperatures in 2010 were still lower than they were during the Medieval Warm Period per this graph, not “twice as high” as you claim. Even worse, about 80% of the rise in temperature from the 1600s to early 20th century occurs prior to CO2 emissions rising above 1 GtC/yr. Umm, no … there is a 0.6 degrees increase from 1600 to around 1900, there is a further 1-1.2 increase up until now. Of course a skeptic doesn’t accept this, because hey you can’t match instrumental data with proxy data (even though it perfectly matches) and the instrumental record is fake anyway, right? Something else besides the 1-to-8 GtC/yr emissions increased caused nearly all of the modern warming. So what was it? Nope, the Sun caused nearly all of the warming prior to industrialization, from then on the increasing CO2 concentration took over, especially in the second half of the 20th century. 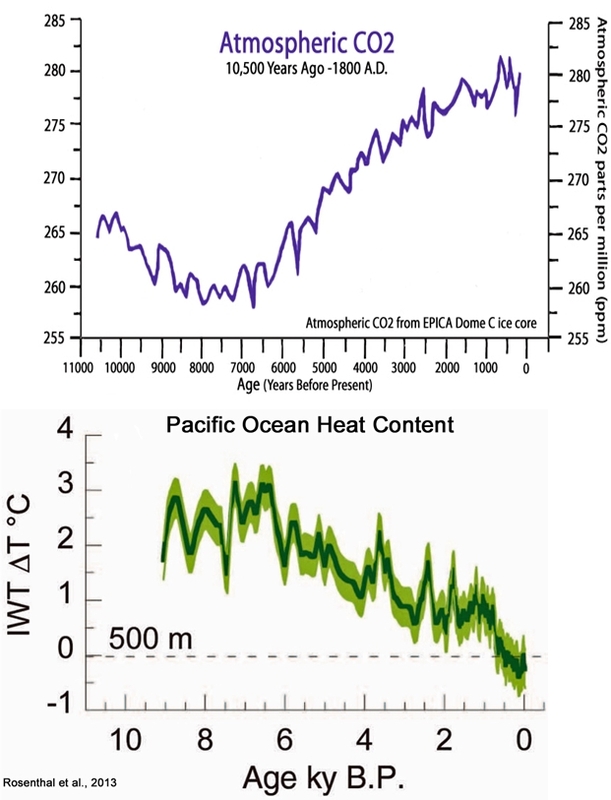 Yes, I am quite aware that there are hockey stick graphs of ocean temperatures that are fit to CO2-based modeling but don’t measure up to the meters-higher sea levels that existed thousands of years ago and the conceptualization that for every 0.4 m of higher sea levels, water temperatures were 1 degree C higher. Can you explain why it is that “thermal expansion” didn’t work back then like it does today? And why did global sea levels only rise by 3.1 inches since 1958 considering CO2 concentrations have risen by 90 ppm during 1958-2014? there is a 0.6 degrees increase from 1600 to around 1900, there is a further 1-1.2 increase up until now. That’s not what the graph itself — which extends through 2010 — shows. Why are you just making stuff up and talking about GIS? Is it because you don’t like it that the graph shows nearly all the warming took place prior to the period when CO2 emissions rose above 1 GtC/yr (the 1940s)? Yes, obviously. When the data don’t fit…just make them up. the Sun caused nearly all of the warming prior to industrialization, from then on the increasing CO2 concentration took over, especially in the second half of the 20th century. Wonderful. So nearly all the warming and cooling of the oceans was caused by the Sun prior to the period when CO2 emissions began rising. And since the 1940s, we’ve enjoyed a Grand Maximum of solar activity, as well as a linked reduction in cloud cover from the 1980s to 2000s, which can explain the modern warming (and cooling) trends. Now that you acknowledge that “the Sun” caused the Medieval Warm Period, the Little Ice Age, and the early 20th century warming, we’ve only got a few more decades to go and the “only about 0.1 C” of warming in the ocean in the last 50 years can be chalked up to the natural climate driver in the sky too. 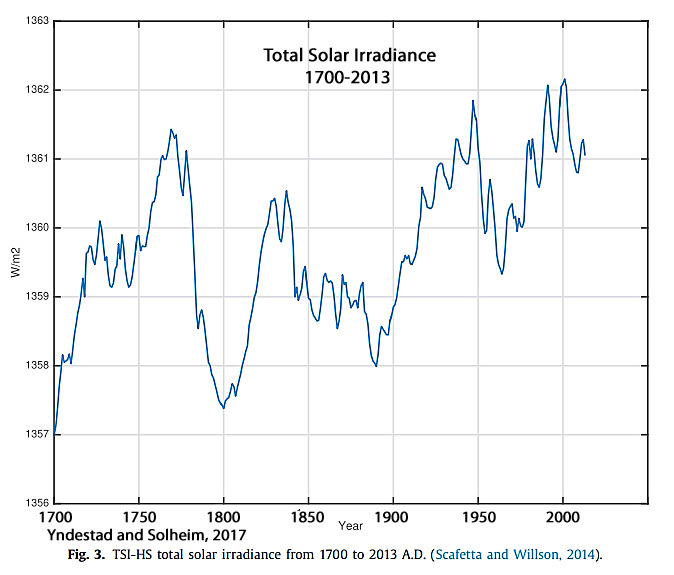 Second half of the 20th century was a time of the strongest sequence of solar cycles since the MWP. And yet you say it stopped having a warming effect, while a small, highly beneficial rise in atmospheric CO2, which doesn’t cause any warming of any sort, suddenly “took-over” warming duties. You are probably refering to this graph, right? May I refer you to wikipedia for this one? What is wrong with you Kenneth? No, I am not referring to a Wikipedia graph. I’m referring to graphs found in scientific papers. Please reply to them, not with more Wikipedia links. Only if you don’t simultanously claim that thermal expansion is not the main driver of sea level rise and then the contradicting claim that since sea level was higher at some point in time, the oceans must have been warmer by XY. It is a scientific impossibility, especially since DWLWR cannot even penetrate a fraction of a mm, causes evaporation and hence surface cooling. Basic known and measured science. SOLAR or GEOLOGICAL energy is responsible for any of the TINY amount of OHC rise since the LIA, which, incidentally was the COLDEST ANOMALY in 10,000 years. 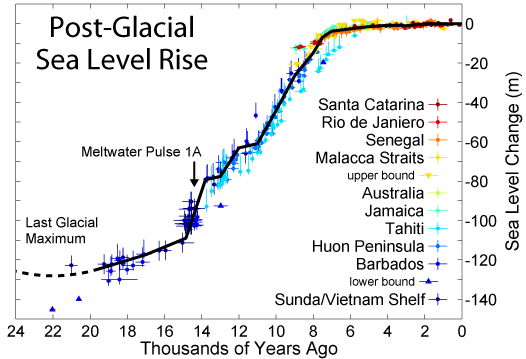 OHC is still very much LESS than it was for most of the interglacial, barely registering as a blip after the LIA. And yet it is quite possible and reliable to detect how high global sea levels were 1,000s of years ago based upon deposits and water lines and human infrastructure, with these sources revealing that sea levels were about 2 or more meters higher than they are today when CO2 levels were in the 260s ppm range. Considering thermal expansion is supposed to add 0.4 m to sea levels for every 1 degree C of warming (an IPCC claim), this would imply that water temperatures were at least 5 degrees C warmer than now from about 5,000 to 7,000 years ago. So what was the cause of all that much higher ocean heat, SebastianH? <em? "AndyG55 never gets tired off telling us that it is impossible to determine OHC "
Certainly not to the accuracy they claim. Do you DENY that ocean coverage was extremely sparse before 2003? Considering thermal expansion is supposed to add 0.4 m to sea levels for every 1 degree C of warming (an IPCC claim), this would imply that water temperatures were at least 5 degrees C warmer than now from about 5,000 to 7,000 years ago. Just as your bank account increasing when you win the lottery doesn’t imply that you won the lottery when your bank account increases. Used to cover up his lack of “awareness” of actual reality. 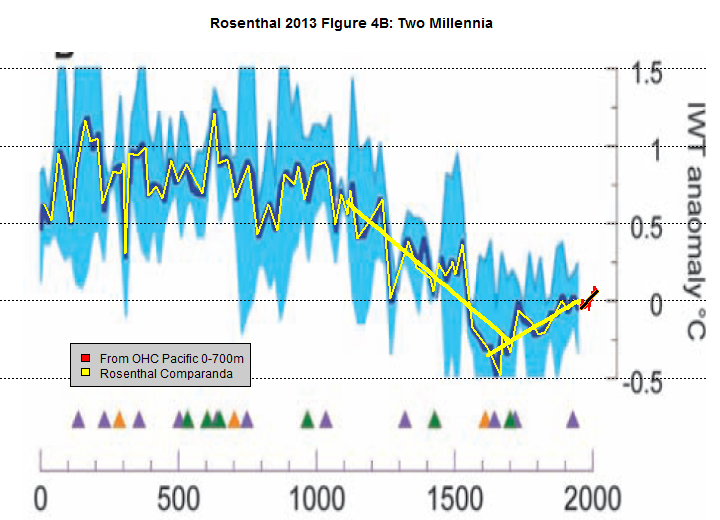 Plenty of evidence that oceans were considerably warmer 5000 – 7000 years ago. ..like basically zero Arctic sea ice in summer for a lot of the time, in multiple areas of the Arctic. You must have forgotten to post your graph. Your rant seems to be EMPTY, yet again. As you well know, there is ZERO real science that shows this enhanced atmospheric CO2 will do ANYTHING except enhance plant growth. The fact that you are going on and on and on and on about OHC shows that you KNOW that the very slight warming is NOT caused by anything to do with humans or human CO2. Thanks for admitting that FACT. Or are you seriously going to pretend that CO2 actually warms oceans down to 2000m or more, when DWLWR cannot even penetrate a tiny fraction of a mm, and actually causes evaporation rather than warming. This paragraph is why I think you have no clue of what you are talking about. Why would the backradiation needs to penetrate the surface to cause warming of the oceans at depth? When an accident causes a traffic jam the cars stopping kilometers from the accident don’t get “penetrated” by the accident either or do they? P.S. : please explain how exactly this causing evaporation actually works. Do you think it is possible to construct a machine that can cool a body of water by using a IR lamp? In effect cooling something by increasing its energy input. Interesting concept and could make you a rich guy. Yet another pointless, meaningless and irrelevant seb analogy. Used when he has NOTHING else. I’m sorry you are “unaware” of the basic physics of evaporation. It seems you want to remain that way. Do you REALLY deny that evaporation doesn’t cause cooling ?? Seriously ??? bizarre !!! You are NOT increasing the energy input into the water with LW radiation, because it never gets more than a fraction of a mm into the surface. Your grasp and understanding of basic physics is stunningly lacking !! Oops, badly worded, late here. “Do you REALLY deny that evaporation causes cooling ?? Seriously ??? seb is probably “unaware” of canvas cooling bags. it CANNOT penetrate more than a tiny fraction of a mm into water. basic MEASURED physics.. do try to learn. !! An increasing GHE causes a decrease in net outgoing radiation (from the ocean to the atmosphere/space). It doesn’t matter how far it penetrates, this effect causes the body of water to warm and of course that increases evaporation too. You seem to claim that this increase in evaporation is greater than the decrease of the net radiation flux. I wonder how that works in your world where you are apparently king of physics. Yeah, sure. But it doesn’t work like you imagine it to be working. Just take it to the extreme. What happens when backradiation would decrease? Would evaporation decrease too? When does it stop? What happens when backradiation reaches zero in a completely IR transparent atmosphere? Or the other way around, backradiation doubles. Would that mean the oceans would evaporate away? Your claim just doesn’t make sense. If it would work like you say it would, you couldn’t keep a soup or any other dish warm under an IR lamp at the restaurant (until it can be served all at once). Fix the problem by learning something REAL. roflmao…. In a closed cabinet stopping convection. You really don’t have much “awaremess” of ANYTHING do you.! I assume you mean the 20 or so year period of adjusted data from the late 1970s to 2000, when CO2 concentration and temperature were actually heading the same direction? and which the AGW farce is built on? Basically zero coincidence at other times…. Yet you keep ranting that CO2 warms the atmosphere. DOH !! No AndyG55, almost certainly he meant what he said. However by 2020 the cooling will begin but such cAGW advocates will not see it through their irrational CO2 dogma. 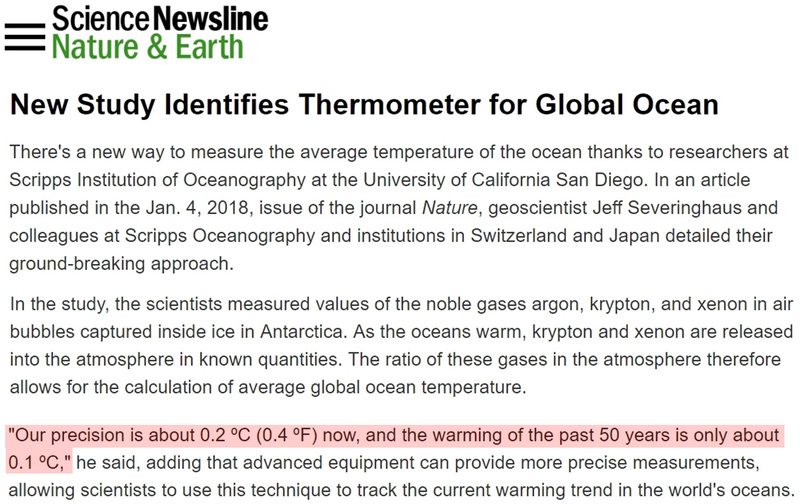 No, I mean that a CO2 concentration change has no 1 on 1 relation with a concurrent temperature change, especially not when the CO2 concentration change isn’t caused by the temperature change (outgassing of the oceans). Yet you keep ranting that CO2 warms the atmosphere. CO2 concentration increase causes the heat content of this planet to increase until the imbalance is matched. Will you take a bet for a round of beer then? What happens when the warming continues? Will you consider your position or will you find another excuse why AGW can’t be real? Weren’t skeptics claiming global cooling would happen back in 2007/2008? Didn’t happen, yet here we are … still strong believers that AGW isn’t real. So if it is warmer in 2025 than today, will you then (again) postpone the cooling prediction until a later date? How often do you think is that possible without looking desperate? Again, ranting BS that you have absolutely ZERO PROOF for. That is NOT science it is mysticism and fantasy. Yet again ignoring basic physics hey seb. You, seb, seem to think that a CO2 correlation equals causation for any climate event. It doesn’t, and CO2 does not control the weather or the climate — unless you have noncontroversial scientific evidence to show otherwise. No seb, you only have opinion, certainly no convincing science. The DOGMA is thick with you. You, seb, seem to think that a CO2 correlation equals causation for any climate event. No I don’t and neither do climate scientists. Trying to argue against this straw man is a hallmark of the skepticism in blogs like this one. It doesn’t, and CO2 does not control the weather or the climate — unless you have noncontroversial scientific evidence to show otherwise. Why would it control the weather or the climate? It is merely causing a slight imbalance that result in an increase in heat content of the whole system. That would be you guys. It means that by 2025 this beginning cooling would be noticeable … what will you do if it is not happening? What dogma will you follow then? Still stick to your story of human emissions have no effect by then? Or let’s say it really cool, because the Sun’s output really decreases by a significant portion and cloud cover increases and what not. What will you do if this decrease is still not as steep as would be expected from a change of those variables? What will you attribute the difference to? Yet again the unproven anti-science nonsense. Please stop making these FANTASY claims until you have solid empirical evidence to back up what you say. So far you are EMPTY, you have produced NOTHING. You have yet to provide one iota of proof that extra atmospheric CO2 does ANYTHING other that enhance plant growth. All you have is an anti-science fantasy. And in the temperature anomaly at 155 meters in depth. How much of this heat makes it to the surface, we will have to see but it does appear that we have the conditions for another El Nino condition later this year. Another burp as the ocean tries to balance itself with the sleepy sun. ? A huge amount of energy was stored in the oceans during the Grand Solar Maximum of last century. CO2 emissions started 2,000 years ago, then swiftly decreased to zero? 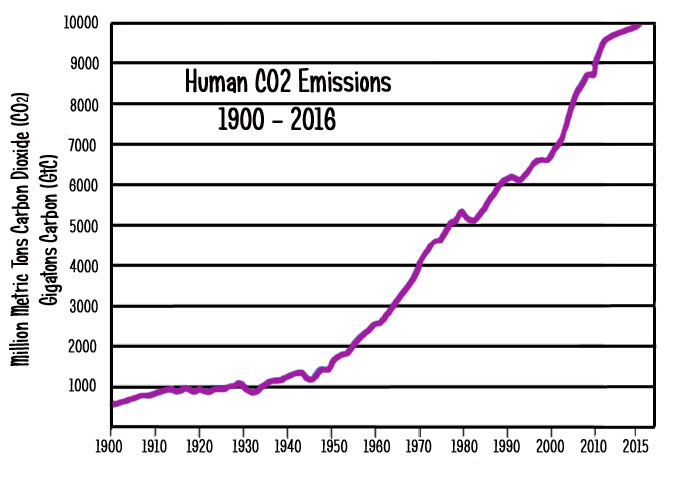 Yes, that graph doesn’t have the proper resolution for CO2. (Not sure what the “swiftly decreased to zero” comment means, though.) Here’s another with the CO2 and Ocean temperatures that better illustrates the long-term anti-correlation (CO2 rises as OHC declines). The time axis is labelled ‘years (prior to today)’, which could be worded better, but to me would imply that the data point 2000 is 2000 years prior to today, or around 17AD at the publication date. But that would make the CO2 plot both in the wrong place and the backwards slope ….. Which temperature data are they plotting btw? This is a useful paper which, unlike most of the Alarmist rubbish, makes a falsifiable prediction that can be tested within 2-3 years. Only issue I see is that the predicted drop in temperature, should it eventuate, may also be caused by the sleepy sun. Or maybe there is some sort of linked causality. Certainly, when cooling does eventuate, it will make an even bigger mess of the claimate models. Wow, the NCDC adjustment troop. Hand in hand as they skip down the aisle. Where did the 1940’s peak go ? Satellites both show zero warming from 2001-2015. It puts specially adjusted temperature series against an impossible CO2 scenario. The graph is basically one big DECEPTION…. …. and you fell for it. !!! Oh, this reply didn’t appear. Well then … why rant about RCP4.5? Your graph is literally the same graph as the one I posted. Only your graph uses LT temperatures, mine the surface records. You really are sucked-in by all this AGW propaganda, aren’t you seb. Probably the first thing you have got correct in the time you have been here. Another small step for seb. You do know that the warming from 1980 in the surface data bares basically zero resemblance to reality, don’t you ? Thanks for drawing even more attention to the incredible farce that is the climate models. So REAL temperature data like UAH should be shown against a higher RCP scenario and the divergence would be hilariously funny. P.S. : Nice attempt at wiggling yourself out of this one. All datasets produce high correlations of anomalies versus independent observations from radiosondes (balloons), but differ somewhat in the metric of most interest, the linear trend beginning in 1979. The trend is an indicator of the response of the climate system to rising greenhouse gas concentrations and other forcings, and so is critical to understanding the climate. The satellite results indicate a range of near-global (+0.07 to +0.13°C decade−1) […] trends (1979–2016), and suggestions are presented to account for these differences. We show evidence that MSUs on National Oceanic and Atmospheric Administration’s satellites (NOAA-12 and −14, 1990–2001+) contain spurious warming, especially noticeable in three of the four satellite datasets. Comparisons with radiosonde datasets independently adjusted for inhomogeneities and Reanalyses suggest the actual tropical (20°S-20°N) trend is +0.10 ± 0.03°C decade−1. This tropical result is over a factor of two less than the trend projected from the average of the IPCC climate model simulations for this same period (+0.27°C decade−1). [A]s new versions of the datasets are produced, trend magnitudes have changed markedly, for example the central estimate of the global trend of the mid-troposphere in Remote Sensing System’s increased 60% from +0.078 to +0.125°C decade−1, between consecutive versions 3.3 and 4.0 (Mears and Wentz 2016). As an experiment, Mears et al. recalculated the RSS overall trend by simply truncating NOAA-14 data after 1999 (which reduced their long-term trend by 0.02 K decade−1). However, this does not address the problem that the trends of the entire NOAA-12 and −14 time series (i.e. pre-2000) are likely too positive and thus still affect the entire time series. 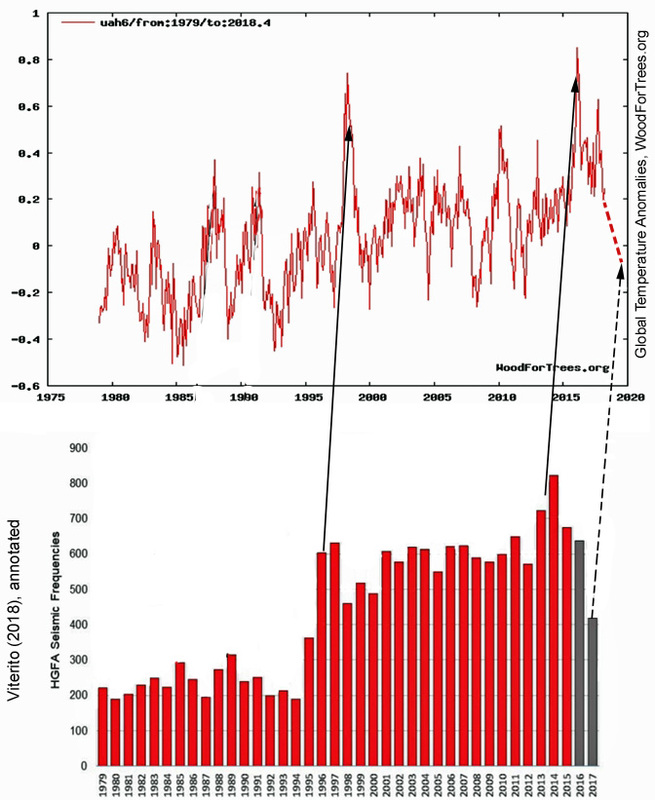 Additionally, the evidence from the Australian and U.S. VIZ comparisons support the hypothesis that RSS contains extra warming (due to NOAA-12, −14 warming.) Overall then, this analysis suggests spurious warming in the central estimate trend of RSS of at least +0.04°C decade−1, which is consistent with results shown later based on other independent constructions for the tropical belt. When examining all of the evidence presented here, i.e. the correlations, magnitude of errors and trend comparisons, the general conclusion is that UAH data tend to agree with (a) both unadjusted and adjusted IGRA radiosondes, (b) independently homogenized radiosonde datasets and (c) Reanalyses at a higher level, sometimes significantly so, than the other three [NOAA, RSS, UW]. One key result here is that substantial evidence exists to show that the processed data from NOAA-12 and −14 (operating in the 1990s) were affected by spurious warming that impacted the four datasets, with UAH the least affected due to its unique merging process. RSS, NOAA and UW show considerably more warming in this period than UAH and more than the US VIZ and Australian radiosondes for the period in which the radiosonde instrumentation did not change. Additionally the same discrepancy was found relative to the composite of all of the radiosondes in the IGRA database, both global and low-latitude. While not definitive, the evidence does support the hypothesis that the processed satellite data of NOAA-12 and −14 are characterized by spurious warming, thus introducing spuriously positive trends in the satellite records. Comparisons with other, independently-constructed datasets (radiosonde and reanalyses) support this hypothesis (Figure 10). Given this result, we estimate the global TMT trend is +0.10 ± 0.03°C decade−1. … The rate of observed warming since 1979 for the tropical atmospheric TMT layer, which we calculate also as +0.10 ± 0.03°C decade−1, is significantly less than the average of that generated by the IPCC AR5 climate model simulations. Because the model trends are on average highly significantly more positive and with a pattern in which their warmest feature appears in the latent-heat release region of the atmosphere, we would hypothesize that a misrepresentation of the basic model physics of the tropical hydrologic cycle (i.e. water vapour, precipitation physics and cloud feedbacks) is a likely candidate. Sorry, I don’t regard Christy as an honest scientist anymore than you probably view Mann & Co. This guy is a climate misinformer and of course he is in favor of UAH, it’s his employer. seb again ADMITS to his lack of awareness of basic physics, maths and engineering involved in analysing satellite data. Many magnitudes beyond his limited awareness of maths, physics etc. Does NOT understand the difference between provable engineering adjustments, and AGW scam driven fabrications. My first published article on geothermal forcing was “Motive Force for All Climate Change” at ClimateRealist, May 2009. It was my pleasure to meet Dr Arthur Viterito at the Heartland ICCC-9 Lukewarmist Love Fest and review his Seismic/PDO data. It took two years to finally get peer published in the crooked system. It is now to the Alarmist to prove human CO2 causes volcanic response. But you can bet they will try to make up some sort of fantasy anti-reality mechanism. O-C-O is indeed a powerful molecule. A mere 0.04% and it will (according to Time magazine) affect seismic activity of the planet. Wow, imagine that back when CO2 levels really changed by major parts of a percentage point then volcanoes and earthquakes must have been popping daily! A mere 0.04% and it will (according to Time magazine) affect seismic activity of the planet. Actually, the change value attributed to humans is +0.012%. And affecting the seismic activity of the planet is nothing. These people even believe that by having the CO2 concentration change by 1 additional part in 10,000, this difference is so profound that it is capable of changing the speed at which the Earth rotates. They just can’t figure out whether it makes it go slower or faster…because, you know, the science is settled. Thanks for the update Kenneth, that makes their ideas even funnier! Well.. it makes me burp, so why not volcanoes !!! Wasn’t it human SIN that cause Pompeii to erupt ? Well, if you guys like these kind of correlations you would probably find it interesting that the number of people who drowned in a swimming-pool correlates to the power generated by US nuclear power plants (90.12%). Correlation not causation. SebH very smart. Now apply to CO2. Regarding CO2 and it’s effect there is an actual mechanism that we know of for approximately a century now. It’s not based on pure correlation like skeptics are trying to convey … it never was. And yet you TOTALLY UNABLE to provide one piece of scientific proof that enhanced CO2 causes anything except enhanced plant growth. That is because the “supposed” mechanism is FLAWED and basically an anti-science FANTASY, based on a monumental lack of “awareness” of anything above very basic physics. There is NO correlation except for short periods and with specifically “adjusted” fantasy data. 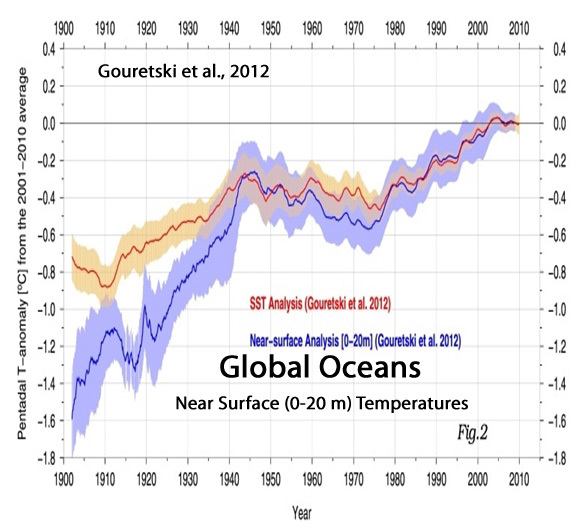 Only real warming in the last 40 years has come from oceans, so CANNOT have a human or CO2 causality. If you have any empirical proof otherwise, which would have to counter basic physics…..
And yet we have no real-world physical measurements that tell us how much cooling is caused in water bodies with this mechanism when CO2 concentrations above them are decreased by 10 parts per million, and how much warming is caused in water bodies when CO2 concentrations are increased by 10 parts per million. It’s all hypothetical and assumptive. But hypotheticals and assumptions are good enough for people like you to just believe anyway. Hey, what about mindless analogies ?? !! How about real-world physical measurements of something falling into a black hole? Or even something falling into the Sun? Can’t provide? So i suppose gravity doesn’t exist around those objects then, right? a) you know such an experiment is near impossible? b) you think that there is no greenhouse effect caused by CO2? c) you think that we don’t know exactly how strong this effect is and it could be well near zero if that is the case? It’s all hypothetical and assumptive. But hypotheticals and assumptions are good enough for people like you to just believe anyway. Your manic ranting evasions of producing anything even resembling actual scientific evidence, are getting quite comical, seb. There is absolutely no empirical evidence of it anywhere, anytime, anyhow. From your comments, I would say that you have basically ZERO knowledge of how water behaves to dwlwr…. or how CO2 behaves in the atmosphere. And you refuse to even try to learn. AndyG55, want to tell us something about your fantasy that reducing the net outgoing radiation flux actually cools a body of water because of increased evaporation? Your lack of even a basic comprehension of evaporation and latent heat is quite comical. CERES shows no reduction in outgoing radiation flux. You were shown that graph the other day. Why do you always AVOID looking at real data, seb ??? Almost as much as you avoid producing it. !! How can one discuss something with a person who misunderstands and misinterprets everything being said? The body of water (the object) gets heated by the Sun. That causes the object to lose heat to its surroundings and one of the pathways is via radiating towards the sky/space. Another is evaporation and conduction. The net heat the object loses due to radiation is the different between all incoming radiation and all outgoing radiation. An increased greenhouse effect causes this net radiation to decrease. Your claim seems to be that what is really happening is that this reduction in heat loss (decrease in outgoing net radiation of the object) gets overcompensated by increased evaporation, effectively causing cooling of the object. Understood? Is that still open to misinterpretation by you? Are you claiming something entirely different or did I get it right? More of your FANTASY. Zero evidence as always. Do you really DENY that evaporation COOLS the surface of an object. Its a simple, measurable FACT. !! Are you really THAT UNAWARE !!! OT. 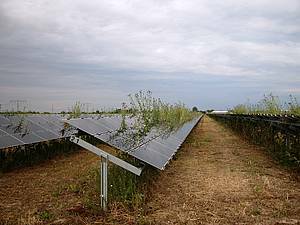 Solar Farms I UK receive more $$$$$ in subsidies than from the electricity they sell. And you can almost bet that when the time comes to tidy up the mess of decaying panels, the subsidy swillers will be nowhere to be seen. Solar in UK is a bit strange at this point. It works ok in southern Germany (subsidies are now down to less than 4 Eurocents per kWh), but so far north? Why would that be the case? And when will those panels exactly decay? Any data on the lifespan? Will they just stop working after the 25 year 80% warranty expires? What do you think? Poor seb, still pushing the solar barrel uphill. An expensive “feel-good” that works for 30-40% of the time at best, and CAN ONLY exist when subsidies are greater than actual income. Need 100% back-up for the many hours when the sun doesn’t shine..
See how long they last once subsidies and feed-in mandates and non-supply protection contracts are removed. 10% … the capacity factor for PV is 10%-ish. and CAN ONLY exist when subsidies are greater than actual income. Why is that noteworthy? Taking Germany as an example PV for residential use gets 12.6 ct/kWh and 4.33 ct/kWh for utility-scale solar, means that at a price of 3.5 to 4.0 ct/kWh at the exchange we pay more subsidies to residents than their electricity gets them on the market. For utilities is only a very small subsidy compared to the market prices. One should also note that residents don’t sell all their generated kWh, but have high self usage. I don’t really know how it works in the UK, but for Germany the system was more or less effective. We aren’t far away from unsubsidized solar parks in Germany, I suppose this should work even better in sunnier regions. Need 100% back-up for the many hours when the sun doesn’t shine..
Umm, yeah. That is the very nature of solar power. Do you think that is news? You could only do that (removing subsidies) for new installations of course and that will happen sooner or later. The rest of your suggestion … well, that would not be very wise. 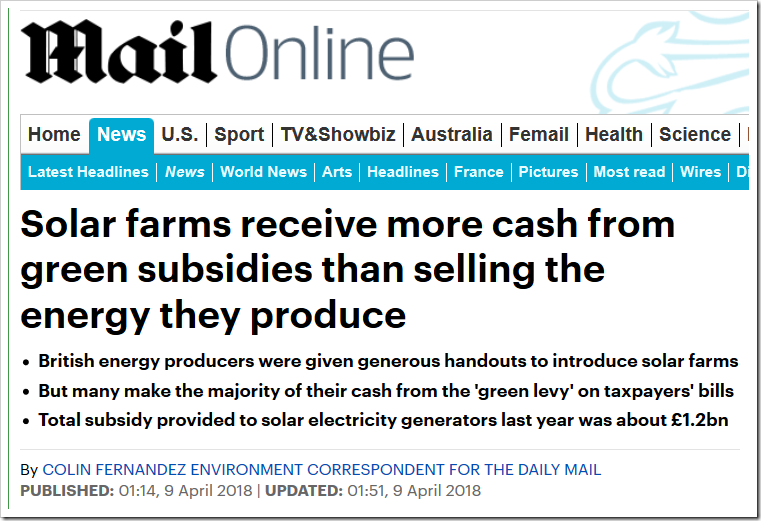 I’m sure the solar panels will work perfectly for AGES, and then the scammers taking the subsidies will clean them all up, without expecting more payment. I don’t know what stories you heard or what your expectations regarding solar power generation are, but why would that happen and why the term “scammers”? This seems like a very serious allegation. How many solar companies have already been caught “playing” the system. Disband the subsidies, get rid of feed-in corruption and level the playing field. There would be ZERO necessity, supply-wise and certainly not economy-wise for solar farms to ever exist. Its a subsidy farm, not much else. So, all the expense of another totally unnecessary system (solar) that has to be supported in every facet of its existence. Much more sensible to build a SINGLE solid, supply-meets-demand system that can operate economically 24/7, and not waste the time money on fanciful subsidy-sucking ‘glamour’ schemes. Even better if it can supply much needed atmospheric CO2. Why Not ??? Any other business that cannot supply on demand goes down the gurgler. You are ADMITTING that feed-in mandates and protection for non-supply are all that holds up the solar industry farce. Another small step forward for seb !! Not in the UK, that is correct. Prices would have to drop a bit more for that to be economical. But it’s close to market price now in Germany and it’s cheaper than anything else in the sunniest region of this planet. It wouldn’t have got there this fast without subsidies. With the inertia solar has now (more new solar was build in 2017 than fossil fuel power plants), the world will slowly fade out subsidies … don’t panic. In case you didn’t know. The amount of panels installed in 2017 was equal to all the panels that have been installed up until 2013. As you surely know solar makes up a tiny percentage of the overall powerconsumption … meaning, when subsidies will stop at some doubling in the future, we will have subdized a tiny percentage of the overall installation of solar panels and will have accelerated the advent of sustainable energy quite a bit. Don’t know why pessimists like you see it so differently. Your manic support for an expensive, subsidy ridden, irregular non-supply (less than 40-50% of the time) is getting very hilarious. Once the UK realises that its huge gas reserves are a MUCH BETTER source and stops their ridiculous anti-fracking leftist policies, solar will rot into the past. I suspect you actually know that, too, which is why you are so irrational about the whole issue. As far as i know the UK is already betting massively on natural gas. Aren’t they going to close all coal power plants by 2025? Seriously, I don’t know what your problem is. Did solar power personaly hurt you? Its a niche market at best unless there is serious government money to be had. A money SINK for the consumer and taxpayer. You still seem to have a serious “lack of awareness” of supply and demand issues. A strong, pretty much constant 24/7 demand, requires strong constant 24/7 supply. Solar need not even apply !. Oh I am sorry, so solar doesn’t provide power when demand is greatest during the day? Solar doesn’t take over most of the daily consumption “mountain” (see https://energy-charts.de/power.htm?source=conventional&year=2018&week=15)? Solar hasn’t reduced the wholesale price of electricity because of this? Or I face reality and see what solar can do and that it ultimately will be the first choice for all things energy if fusion reactors continue to be “just 30 years” away from commmercial usage. And the tiny bit of subsidies we invested to accelerate the advent of sustainable energy will have been worth it. Try seeing what solar can do in the middle of the night. Seems seb is “unaware” of base load. Add it to the long, long list. I am very aware of baseload, AndyG55. Mentioning that over and over is in conflict with mentioning how little solar contributes to global power consumption. We are a few years away from solar providing enough power to even touch baseload, don’t you think? It’s smoothing the “mountain” of midday electricity consumption on sunny days. That’s all. We can talk about the need for storage for the night and seasonal storage, but it’s not necessary to install massive storage solutions for at least a few decades at the current growth. And yes, we have seen how much the price of electricity in Germany and the UK has dropped. Yes, it actually dropped. The residential rate increased in Germany, but the actual price of electricity dropped. Obviously you are NOT, otherwise you wouldn’t be a low-awareness shill for wind and solar. As you say, solar is just a TINY niche market, but because of ridiculous subsidies and feed-in rules is DESTROYING the stability of grids. I hope the residents, ie all Germans, enjoy that !! “We are a few years away from solar providing enough power to even touch baseload,”</em. Is that another seb quote from Never-Never FANTASY land ? Gaming the subsidy system is all the operators and proponents of ruinable wind and solar energy have. Take away the subsidy and they fall. Gas, oil and COAL require no subsidy, and yet they can supply electricity 24/7/365, something the ruinable technology will never do. No one asked the question what the heck caused seismic activity to increase by a 100% for the years 1996 to 2016 and then abruptly drop. There is a real physical mystery here. There must be a forcing function to cause the change in seismic activity. The abrupt change in the seismic activity correlates in time with an abrupt change to the geomagnetic field. The geomagnetic field is now decaying at 5% per decade where previously it was previously decaying at 5% per century. In the last 10 years the geomagnetic specialists have determined the geomagnetic field of the planet has in the past changed cyclically with the changes correlating with climate change. The changes in the geomagnetic field which have been discovered are orders of magnitude too large and too fast for a core-based change. There is no mechanism to cause abrupt short term changes to the earth’s core and even if there were, do to the physics (their is a back EMF that is generated by the mantel that would resist any core based change which is one of the reasons why it was assumed that geomagnetic reversal took 1000s of years to occur. There are now three independent (different locations) field evidences of super rapid geomagnetic reversal. 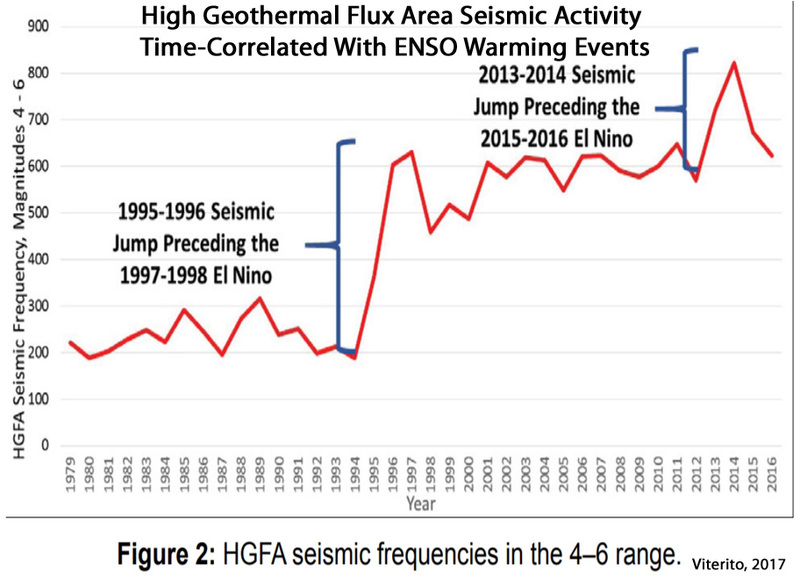 Figure 2: HGFA seismic frequencies, moment magnitude range 4-6. 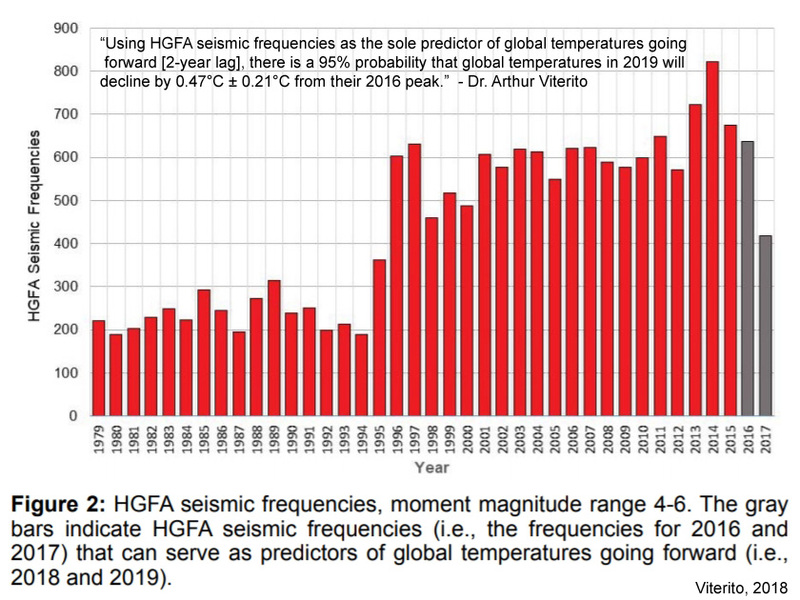 The gray bars indicate HGFA seismic frequencies (i.e., the frequencies for 2016 and 2017) that can serve as predictors of global temperatures going forward (i.e., 2018 and 2019). The north magnetic pole (NMP) is the point at the Earth’s surface where the geomagnetic field is directed vertically downward. It drifts in time as a result of core convection, which sustains the Earth’s main magnetic field through the geodynamo process. During the 1990s the NMP drift speed suddenly increased from 15 kilometers per year at the start of the decade to 55 kilometers per year by the decade’s end. This acceleration was all the more surprising given that the NMP drift speed had remained less than 15 kilometers per year over the previous 150 years of observation. William: The drift of the North Magnetic Pole is now starting to slow down reversing the change following in time with the reduction in seismic activity. @Art Viterito: why not label the x-axis with the year/month and instead use a non-descript counter? And how high is the chance that this is a so called spurious correlation? I mean, the global GDP also increased in the same fashion as temperature. Does that mean GDP causes temperature to rise? Oh dear, Seb is unable to comprehend the graph without actual dates…. It really is all too much for you, isn’t it , seb. And yep, there is no mechanism for CO2 warming oceans or anything else. Something you have yet to become “aware” of. There is solid probable mechanism for seismic and volcanic activity under the oceans causing warming of the oceans. Magma is pretty warm, ya know. ! Also, note how the seismic activity is basically trend=0 between 1980-1997 then 2001-2015. Why would CO2 cause seismic activity? Why would that even be necessary for it to cause temperature increase? Measured in mW/m² … do you think that has a major influence on Ocean temperature over the multiple W/m² forcing variations necessary for the current change of the climate? So a piddling amount of small energy long-wave radiation from above, that cannot even penetrate a fraction of a mm into the surface is meant to warm the oceans, but magma below at thousands of degrees in temperature, doesn’t warm water. You really are loosing your grasp on reality, seb. Seems you have never even boiled a saucepan of water, and think it gets heated from above. DOH ! Dear AndyG55, the reality is that a few mW/m² of change is magnitudes smaller than the W/m² forcings causing climate change. Try boiling water with your saucepan on a 10 W stove vs. getting it to boil in a 1000 Watt microwave. Again with the unsubstantiated BS. Which you say you cannot possibly measure the effect of. Still waiting for that empirical proof that enhanced atmospheric CO2 causes ANYTHING except enhanced plant growth. And the fact you think a microwave is the same as DWLWR shows the very depths of your ignorance to do with radiation effects on water. Thanks for show that to everyone. Of course we can. Measure the overall heat content of the system and voila, you get the necessary imbalance to cause the measured changes. No, I don’t. Are you doing this on purpose to troll me or do you really think that I wrote this? 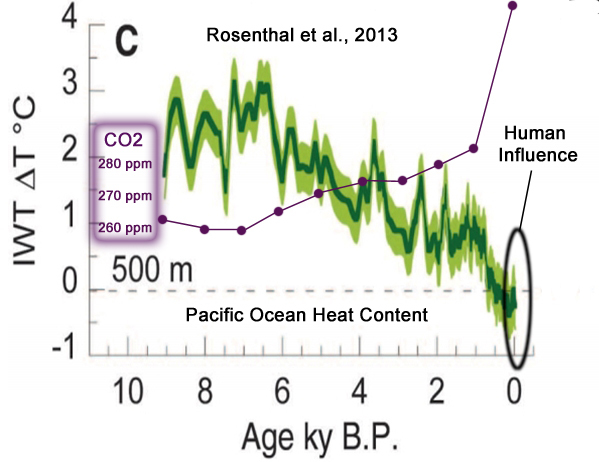 OHC content CANNOT come from human CO2 effects. Human CO2 emissions CANNOT warm ocean waters. Evaporation causes COOLING… KNOWN fact. Why did you even bother mentioning microwaves? DECEPTION is the only possibility you could admit to. Are you trying to cover up for your attempted deception, yet again, seb? You typed it… you wear it. The reason for the “nondescript counter” is quite simple: the phenomena are lagged. So, “Period 1” is the plot of the 1979 seismic frequency paired with the 1981 temperature. “Period 2” is the plot of the 1980 seismic frequency with the 1982 temperature, and so forth. As for the question of a spurious correlation, that is highly unlikely as we’ve identified a physical mechanism which accounts for the correlation. That is, increasing geothermal heating along the mid-ocean ridges destabilizes the overlying water column and that causes the thermohaline circulation to intensify. An intensified thermohaline circulation transports greater amounts of heat into the Arctic. Bottom warming also enhances thermobaric convection in the polar regions, a mechanism that vertically transports heat from lower layers of the ocean to the surface. All of this is documented in the reference sections of the papers I’ve written. Sadly, most critics of my work don’t take the time to check those references. Well, I took the time to find out the magnitudes of “warming from the bottom” (1) vs. “warming from the top” (2) and they don’t match up and changes in (1) don’t seem to be big enough to cause anything that looks like the warming we observe. That seems to require a forcing of around 1 W/m². So did the change of seismic activity cause a change of the global average “warming from the bottom” by this amount? I doubt it very much. I can explain the link between ocean floor movement and atmospheric CO2 changes. The same mechanism explains why there could be a simultaneous increase in seismic activity in geologically separate regions. It has been known for some time that convection motion in the earth does not and cannot physically explain plate tectonics and plate tectonics does not explain mountain building. The lack of a forcing mechanism explains why the theory of plate tectonics took so long to be accepted. Based on observations (there are roughly 50 independent observations that support the assertion) plate tectonics is driven by liquid CH4 that is extruded from the liquid core of the planet as it solidifies. The assertion that there is liquid CH4 in the liquid core of the earth is consistent with the analysis of wave velocity which shows there must be light elements in the core and theoretical analysis for the liquid core that shows CH4 can ‘dissolve’ in the liquid core and would be extruded when a portion of liquid core solidifies. It is believed the core of the planet started to solidify roughly a billion years ago. At that time there would be a large increase in extruded liquid CH4 which explains why there is a sudden increase in continent crust building at that time. The sudden increase in continental crust building and the increase in water on the planet at the time is the likely explanation for the Cambrian ‘explosion’ of complex life forms. The continuous release of CH4 up into the mantel and then up to the crust and into the biosphere explains why the earth is 70% covered with water even though there is continuous removal of water from the earth’s atmosphere by the solar wind. This is ignored paradox. Organic metals form in the very, very, high pressure liquid CH4. These organic metals drop at specific pressures. The forced movement of the super high-pressure liquid CH4 from the liquid core and drop out of the organic metals at specific pressures explains why there is heavy metal concentration in the crust of in some cases a million times more than the mantel. The same mechanism explains why there is helium in some natural gas fields and oil fields. The helium is produced from radioactive decay of the concentrated Uranium and Thorium that drops out at specific pressures. The super high pressure CH4 that is moving through the mantel provides a path for the helium gas to move up to higher locations where the natural gas and oil are found. The same mechanism also explains why the tectonic plate movement has double in speed in the last 2 billion years. The carbon in the CH4 that is released from the core was a low ratio of C13/C12. The continual new source of low C13/C12 from the core CH4 explains why the ratio of C13/C12 remains the same in sediments in geological formations. Plants preferentially use CO2 with C12 rather CO2 with C13. The competing paradigm is that the carbon is recycled in the crust which would result increased ratio of C13/C12 in the sediments. The following is non peer reviewed, summary of the problem situation (failure of the standard paradigm to explain plate tectonics and mountain building). “In 2002 it could be said that: “Although the concept of plates moving on Earth’s surface is universally accepted, it is less clear which forces cause that motion. Understanding the mechanism of plate tectonics is one of the most important problems in the geosciences”8. A 2004 paper noted that “considerable debate remains about the driving forces of the tectonic plates and their relative contribution”40. “The advent of plate tectonics made the classical mantle convection hypothesis even more untenable. For instance, the supposition that mid-oceanic ridges are the site of upwelling and trenches are that of sinking of the large scale convective flow cannot be valid, because it is now established that actively spreading, oceanic ridges migrate and often collide with trenches”14. “Another difficulty is that if this is currently the main mechanism, the major convection cells would have to have about half the width of the large oceans, with a pattern of motion that would have to be more or less constant over very large areas under the lithosphere. This would fail to explain the relative motion of plates with irregularly shaped margins at the Mid-Atlantic ridge and Carlsberg ridge, and the motion of small plates, such as the Caribbean and the Philippine plates”19. The below peer reviewed paper makes the same assertions as the above review. The new hypothesis for earth lithosphere evolution however is not correct. From https://news.nationalgeographic.com/news/2006/08/060830-carbon-lakes.html CO2 liquid puddles near underwater vents. I also note that when investigated there are large CO2 liquid pools near deep ocean volcanic vents, discovered and shown by James Cameron back in 2012 when investigating the Marianas Trench. So not so rare as National Geographic wants you to believe. And also these vent issue water “hot enough to melt lead”. Quite a lot of energy there then. And for added interest here’s a link to the diaries of the expeditions. Art Viterito, IMO the main problem with things underwater is that we know more about the surface of the moon than our great oceans and seas. Is the outpouring from someone inflated with hubris, and knowledge well beyond their ability understanding. The plain fact is we don’t know, and because of such hubristic attitudes pervading “climate science” we are very unlikely to find out. So you expect there to be lots of unknown which raise the geothermal output to magnitudes higher than what we already know. This is strange coming from a skeptic who is talking about actual measurements and hates hypotheticals. Why employ the “unknown” now to argue that it still could be true? Hey, maybe there is some alien controlling the climate. We simply don’t know, so we should rule that out, right? Yep, that alien will never be found because we are not looking for it. Damn it, have to stick to what we already know. P.S. : There was a time on this blog when you guys argued that the CO2 concentration increase was due to volcanoes, completely ignoring that we roughly know how much CO2 volcanoes emit. Is this another instance of that wishful thinking that everything could be explained by completely natural processes? P.P.S. : Since you mention 450°C hot water coming out from some vents, maybe you could do the simple calculation and calculate the amount of water that could be heated from 0 to 450°C by the OHC increase of the last 30 years. Put that into perspective to the outflow of those vents. How many vents would it take to match that OHC increase? Let’s see if that revelation helps you see things clearly. Wilfully ignorant of how little they actually know (that is actually correct)…. and absolutely determined to stay that way. Why do you continue to make mind-numbed statements you can’t back up, seb? There is no mechanism, and no evidence. Plenty of evidence that there are FAR MORE volcanic vents below the ocean than we thought. The crust is thinnest below the oceans, or were you UNAWARE of that too, seb. Again it is noted that you provide absolutely ZERO in the way of actual science. Yet we keep finding new volcanic output under the sea. YOU, certainly, are clueless about it. Probably a fraction of a degree, which depends on how many volcanic outlets there are.. which we have almost seriously under estimated. Oh wait. That’s what it has been, a tiny fraction of a degree out of the COLDEST period in 10,000 years. FAR, FAR less than the 3-4 WHOLE degrees of OHC decrease during the neoglaciation. Or are you going to continue to DENY climate change? So HILARIOUS that you think some imaginary radiation from atmospheric CO2 that is COLDER than the oceans, would have more warming effect than a HUGE number of volcanic outlets at 400ºC or more. seb, your illogicality (like your hubris) appears to have no bounds. Another dumb insulting analogy. No! My point is we do not know! It is not settled and all the UN-IPCC guesstimates are not facts. All the confidence levels in the world come to nought when nature make a decision. And no, the unverified computer models do not show possible futures, as they are not reality, or even a close model of reality. Consensus ‘climate science’ consistently come up with the wrong answers because the bureaucrats have deemed the subject “settled science” and can not be questioned. The UN-IPCC have propagandized and elevated ‘climate science’ and ‘the climate’ to be one of most important subject (if not the most important) in order to garner power for itself. That’s all there is to your “climate science”, consensus and bureaucratic dictates. No progress, no advancement, no skeptical investigation of probabilities. No, your world appears to be that all has been found nothing left to find. That is hubristic effluent! P.S. We do not ‘know’ how much CO2 comes from all currently erupting, and CO2 seepage from older so called dormant volcanoes and old lava flows — lake Nyos is a stunning example — because, well there is little investigation. Not that there is not plenty to find, there is and some people are trying to rectify this situation. In 1992, it was thought that volcanic degassing released something like 100 million tons of CO2 each year. Around the turn of the millennium, this figure was getting closer to 200. By February 2014, a team led by Mike Burton and the Italian National Institute of Geophysics and Volcanology – and it’s estimates are just shy of 600 million tons. It caps a staggering trend: A six-fold increase in just two decades. NOTE – since 2014 more has been found… heading towards 1000 million tons. A later team with Mike Burton found another 91 volcanoes around the Antarctic circle (https://wattsupwiththat.com/2017/08/14/scientists-discover-91-volcanoes-below-antarctic-ice-sheet/). So seb, you still ‘believe’ the IPCC guesstimates or do you understand that when investigated, even at this merger level by very few people, the picture is not static but still evolving, or are you still mired in the ‘settled science’. SebastianH – your comment that the amount of heat coming up from the bottom doesn’t seem sufficient to cause warming at the surface is a misunderstanding on your part. That’s not how the system works, i.e., simple diffusion of heat from the bottom will not have a large impact on global atmospheric temperatures. What the heating at the bottom does is it destabilizes the cold bottom waters, much the way heating cold water on a stove stirs the water at the bottom of the pot. This destabilization of the water column causes the ocean conveyor to move faster, thus transporting heat from lower latitudes to the poles more rapidly. The oceanographic literature is clear on this: geothermal heating of the bottom waters intensifies the ocean conveyor system by 10% – 30%, resulting in faster – and thus greater – heat flow to the poles. By way of analogy, it’s akin to having a pizza delivered to your house. In one case, the pizza comes out of the oven at say 180 degrees F, but the pizza delivery person gets stuck in traffic on the way to your house. This allows more time for the heat to dissipate en route, leaving you with a cold pizza when it gets to your home. In a second case, the pizza still leaves the oven at the same temperature but in this scenario, there is no traffic, and the pizza delivery person spends a short amount of time getting to your house. As a result, and your pizza is now delivered at a higher temperature. In the ocean conveyor system, the water leaves the tropics at a high temperature, but the speed at which it is transported is critical to the temperature it’s going to have when it reaches the pole. The greater the speed – i.e., determined in part by the amount of geothermal heat at the bottom – the higher the water’s temperature when it gets to the pole. The higher the temperature at the pole, the less ice that is formed and the warmer the temperature due to radiational and convective transfer of heat from the water to the overlying atmosphere. There’s also a positive feedback from a lowered polar albedo. Indeed current estimate put the number at 3,477,403 submarine volcanoes exist worldwide. Now that wouldn’t increase the CO2 levels much, eh? Here is another supporting anomaly. Five independent (different magma chambers) Auckland volcanoes that simultaneously erupt and capture a geomagnetic excursion. Weird that the very rare geomagnetic excursion occurs at the same time five independent volcanoes all erupt. Five monogenetic volcanoes within the Quaternary Auckland volcanic field are shown to have recorded a virtually identical but anomalous paleomagnetic direction (mean inclination and declination of 61.7° and 351.0°, respectively), consistent with the capture of a geomagnetic excursion. Based on documented rates of change of paleomagnetic field direction during excursions this implies that the volcanoes may have all formed within a period of only 50–100 years or less. These temporally linked volcanoes are widespread throughout the field and appear not to be structurally related. However, the general paradigm for the reawakening of monogenetic fields is that only a single new volcano or group of closely spaced vents is created, typically at intervals of several hundred years or more. Therefore, the results presented show that for any monogenetic field the impact of renewed eruptive activity may be significantly under-estimated, especially for potentially affected population centres and the siting of sensitive facilities. It is a fact that there is unequivocal evidence of cyclic abrupt climate change in the Paleo record that does not have an explanation, a physical cause. There are burn marks on the surface of the earth (18 different locations, three continents) that correlate in time with the occurrence of the Younger Dryas and an abrupt change to the geomagnetic field? The planet when from interglacial warm to glacial cold, for 1200 years, during the YD, 12,900 years ago, at a time when solar insolation at 65N was maximum which is one of dozen independent observations that supports the assertion that changes in solar insolation at 65N does not cause the glacial interglacial cycle. …we argue that this is indeed supported by three observations: (1) the abrupt and strong increase in residual 14C at the start of the Younger Dryas that seems to be too sharp to be caused by ocean circulation changes alone, (2) the Younger Dryas being part of an approxl. 2500 year quasi-cycle also found in the 14C record that is supposedly of solar origin, (3) the registration of the Younger Dryas in geological records in the tropics and the mid-latitudes of the Southern Hemisphere. No, no, this is all wrong. Don’t you follow climate science? The lag and the increase in the thing that caused the warming are supposed to come AFTER the warming. Because feedbacks and consensuses and tachyons and stuff.